The tower of power pumping through a stack of 10-inchers is the legendary bass tone for players who enjoy being heard. From chunky funk with the ubiquitous flip top, to the higher gain growl of indie rock. Still need more? Lean on the Character control for the fat distortion of Crimson and Kings X. It all sounds massive DI. Clean SVT thump to dirty earthquaking rump, you dial it in. This is Version 2 which features a speaker sim defeat switch. The Character Series pedals take their mojo from the most respected amp tones on both sides of the Atlantic. These pedals dont just have a single character, they have the whole cast, plot, and curtain call. The Level and Drive controls work like a traditional, well-equipped amp. Low, Mid and High, however, are active, providing a wider array of tonal possibilities. Then theres the Character knob, which is something quite unique. This continuously-variable control moves seamlessly between different model voicings, covering vintage, high-gain, and face-melting lead tones. The Character and Mid controls, and the speaker emulations, are all engineered to personify the specific amplifier traits and speakers associated with each amplifier type. 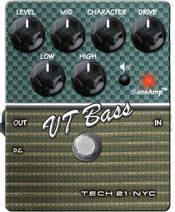 Put simply, Tech 21 has crammed the entire lineage of each amp style into a funky little box. Lets me play direct into the PA.